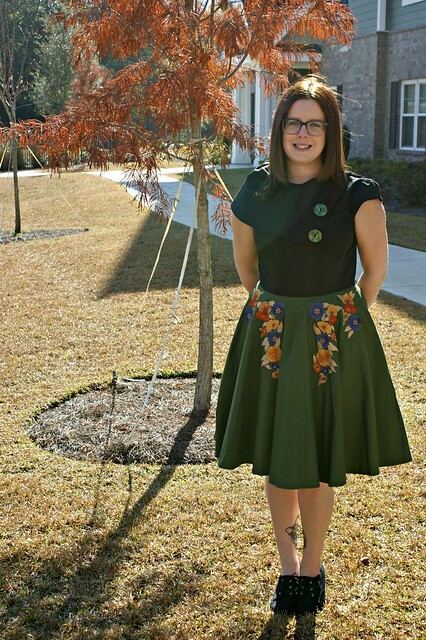 I was recently approached by eShakti and was asked if I would sample an item of their clothing! This type of blogging project is perfect for me and right up my street. Before I jumped in, I did take the time to have a look at what they had to offer. I must admit that it did not take me long at all to decide that I wanted to be involved! They have an amazing range of clothing including dresses, shirts, skirts and coats. All of which can be made to your size and customised to your style. I had a tough time choosing a dress to try out. Whenever I buy a dress, it is usually from the sale rail and I buy it because it is a bargain. I really like dresses that are inspired by the 40s, 50s and 60s, but these styles are often the most expensive in the shops so I am yet to purchase one. 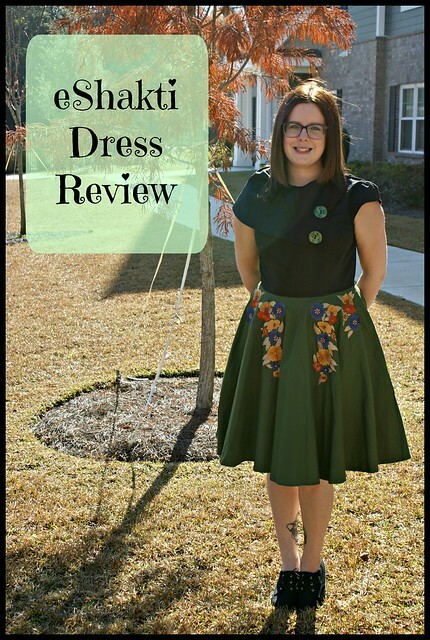 Many of the styles on eShakti appealed to me because they have that vintage style whilst still being a new product that is made to measure. 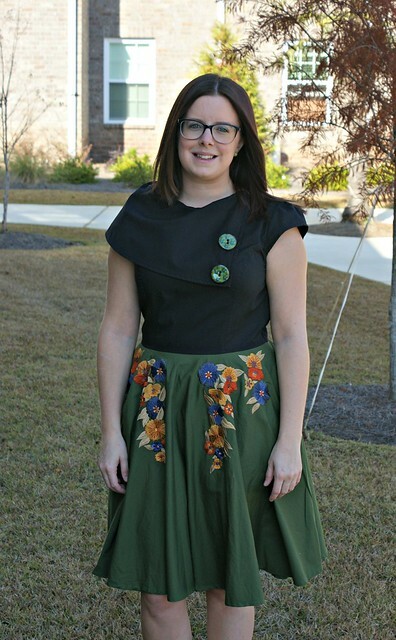 I picked this gorgeous embroidered olive & black dress with a fold over collar. I originally picked it because of the unusual collar. When I took a closer look, I fell in love with the delicate embroidered flowers and the beautiful buttons on the collar. The shopping and ordering process was easy to do and very smooth. I took my measurements and I was a straight size 12. They do have an additional option though, to enter your own measurements if your measurements differ to the ones allocated to a specific size – how great is that! 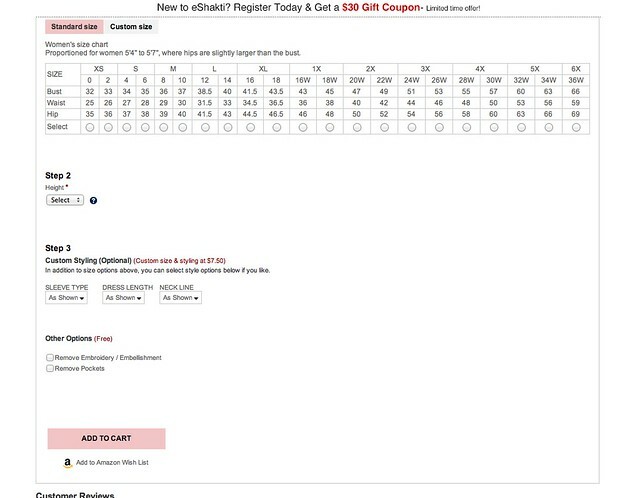 The ordering page also gives you a few other options for customisation. You can have the option to change the length, the neckline/ collar, the sleeves and pockets. I chose to add pockets and I shortened the length a little. The dress arrived within a week of ordering and it fit like a glove! I had a few photographs taken outside of the apartment, but I am showcasing this dress tonight at the Preservation Hall in New Orleans! Obviously, I needed to test out the swirl factor. It swirls! Perfect for dancing along to the jazz band! So, eShakti have given me a discount code to share with my readers! Use ‘threadsandbobbins’ to get 10% off your order until 01/22/15. I think they also have a $30 gift card on offer when you make your first order so check them out! It is a lovely look. This is a different and beautiful dress which really suits you 🙂 Enjoy debuting it tonight, you will look stunning! What an unusual style, I love it! It’s great that it fit perfectly first time which is always an issue when ordering online. Have a Happy Christmas! Pingback: Talented Tuesday Link Party #9 - Cook. Craft. Love. 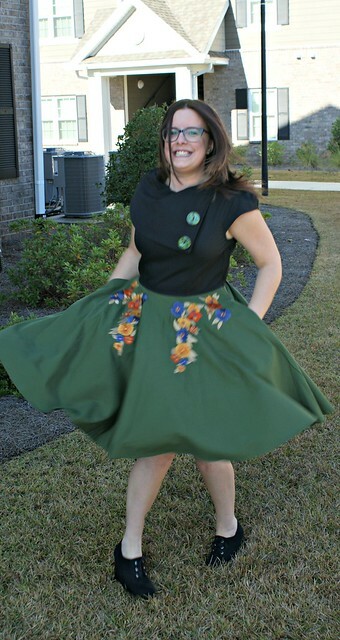 This is a very fab and fun dress, I especially love the bodice.it really looks wonderful on you. I had never heard of eShakti before but I am off to check them out. I love the idea of the custom fit, definately worth a try. Thank you 🙂 It is certainly one of my favourites in my wardrobe!